Kilmer, Wagner & Wise can provide you with a complete line of cable ties in a variety of styles and strengths. Contact your sales representitive or call customer service for pricing and availability. Nylon 66 Heat Stabilized – Heat Stabilized Nylon 66 is the material used when resistance to higher temperatures is required. The working temperature range for this material is from -40 degrees F to 221 degrees F. It meets UL94V-2 flammability rating. Polypropylene – For applications where chemical effects on nylon are a concern, Polypropylene is the material of choice. Resistance to chemicals such as hydrochloric acids, sodium chloride, and other basic salts are examples of such applications. Polypropylene, while it has the ability to withstand ultraviolet light exposure, does have a lower tensile strength than Nylon 66. Tefzel – Tefzel provides radiation resistance to a wide range of chemicals, including sulfuric acids and hydorfluoric acids. Radiation resistance up to 100 megarads, Tefzel withstands high temperatures, ultraviolet light exposure, and meets UL flammability requirement 94V-0. 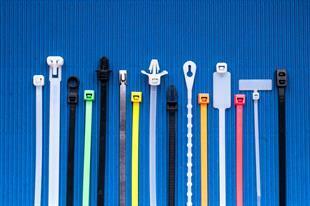 Cable Ties are available in a wide range of colors in addition to Natural and UV Black. Colored cable ties are used anytime when distinguishing ties are needed, such asin the racing industry or for applications requiring identification of wire bundling.